Jordan and family are heading to Ecuador in May to teach EBIO 3780 ’Tropical Field Biology & Conservation’, a field course in Ecuador. Jordan will be presenting at the PALMS conference in Montenegro Colombia in June, and the Ecological Society of America conference in Baltimore MD in August. Jenny received an NSF DDIG to expand her work in nectar robbery and hummingbird pollination and an EEB Departmental Fellowship to help with writing up in the Fall. This summer, she will be radio tracking hummingbirds in Peru. Sam received the 2014/15 Best Teaching Assistant award for Department of Ecology & Evolutionary Biology as well as the prestigious Tulane Woodrow Wilson Teaching Fellowship in the School of Science & Engineering for the 2015/16 year. She will be in Australia this summer, gathering data on fairy-wren condition and habitat use outside Brisbane. Luke, former post-doc Kym Ottewell, and Jordan published the paper ‘The short-term genetic consequences of habitat loss and fragmentation for the neotropical palm Oenocarpus bataua’ in Heredity (Browne et al. 2015). Luke was also awarded DDIG funding from the NSF to continue work on the impacts of habitat fragmentation on gene flow in the Oenocarpus system. He will be helping to teach EBIO 3780, presenting at the PALMS conference in Montenegro Colombia in June, and conducting research in Ecuador and in the lab this summer. 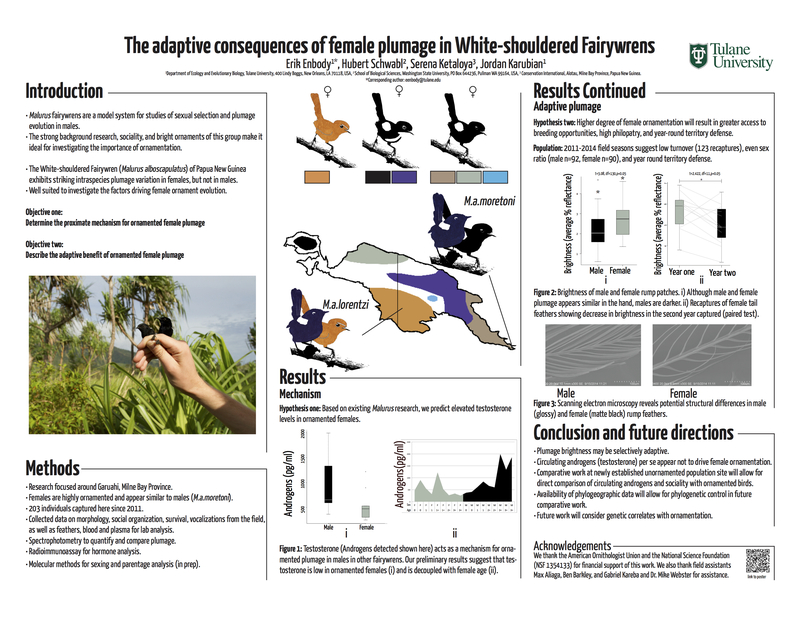 Erik received a grant from the American Museum of Natural History for his work on the evolution of sexual dimorphism in white-shouldered fairy-wrens, and presented a poster at the American Ornithologists Union (AOU) on his work. He is heading to Papua New Guinea for another field season. Brock received grants from the Animal Behavior Society, the Wilson Ornithological Society, and the Louisiana Sea Grant for his research on brown pelican foraging ecology, and also presented a poster at AOU. He will be tracking GPS-equipped pelicans in the Gulf of Mexico this summer. Zoe completed her first year of graduate school in high style, and received a NSF Graduate Research Fellowship to boot! She will be helping to teach EBIO 3780, participating in an OTS course in Costa Rica, and conducting pilot field research in Ecuador this summer.